Test your firefighting skills with Ryker from Disney’s Planes: Fire and Rescue! Featuring a special tool, this veteran of the Transportation Management Safety Team (TMST) is ready to take his experience from the tarmac to the tub! Once submerged, push the red button on Ryker’s back and he will shoot water out of his hose like a squirt gun. Use his hose to help direct play action: just rotate, aim, and shoot! You’ve put out all the “fires”, way to go! Large-scale Ryker appears with his signature yellow and blue deco that fans will recognize from the movie. Ryker can float on water or use his wheels to roll across a flat surface making him the perfect toy for bath or land-based play. Includes Ryker vehicle. Colors and decorations may vary. 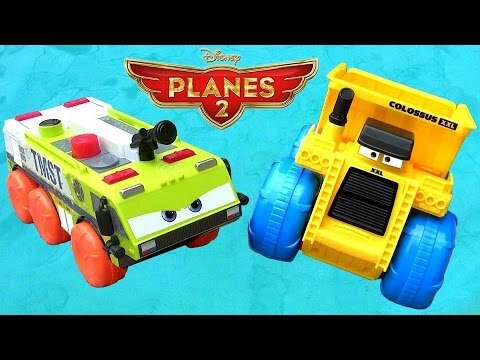 • Turn bath time into a firefighting mission with Ryker from Disney’s Planes: Fire and Rescue! • Put out the “fires” using Ryker’s special hose! Just rotate, aim, and shoot! Water will squirt out when you press the red button. • Comes in large-scale with true-to-movie styling and details. • With the ability to float on water and roll across land, Ryker features 2 ways to play out your own story! • Includes large-scale Ryker vehicle.